These smaller rays rarely grow more than 3 feet wide, their sharply angular pectoral discs wider than their bodies are long. Their heads protrude distinctly from their find space, giving them a duck-billed look in profile. Ranging from chocolate to gray on top, and white underneath, they are ideally colored to ‘flapping’ around shallow estuaries and bays, and skimming along sandy bottoms looking for crustaceans and mollusks. They are mostly harmless to humans but should be handled with caution because of the sharp spine at the base of the whip-like tail. 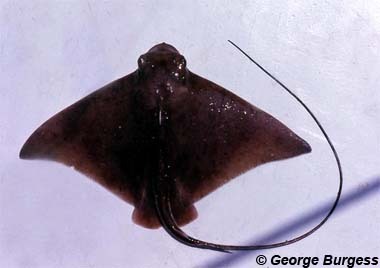 English language common names for this ray include bullnose ray, blue-nosed ray, bullnose eagle ray, eagle ray, longtail stingray, sharpnosed ray, and stingree. Other common names are aigle de mer taureau (French), arraia-amarela (Portuguese), arraia-sapo (Portuguese), chucho (Spanish), chucho blanco (Spanish), raia-sapo (Portuguese), raia-touro (Portuguese), and stierneusadelaarsrog (Dutch). Of minor commercial importance, the bullnose ray is used in Central America for human consumption. It is caught with longlines and trammels and marketed in this region both fresh and salted. The bullnose ray is harmless to humans. The bullnose ray is not listed as endangered or vulnerable with the World Conservation Union (IUCN). The IUCN is a global union of states, governmental agencies, and non-governmental organizations in a partnership that assesses the conservation status of species. > Check the status of the bullnose ray at the IUCN website. 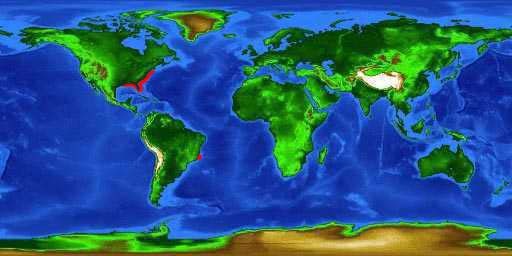 The bullnose ray is distributed subtropically in the western Atlantic Ocean from Cape Cod (Massachusetts) to the southeastern coast of the Florida off the U.S. It has also been reported, but not confirmed, in waters off southern Brazil and northern South America as well as in the waters of the Caribbean and the Gulf of Mexico. Although it is often found in shallow estuaries to 394 feet (10 meters) in depth, the bullnose ray has been recorded at depths of 3,937 feet (100 meters). It tends to swim at midwater, cruising close to the bottom when searching for prey. 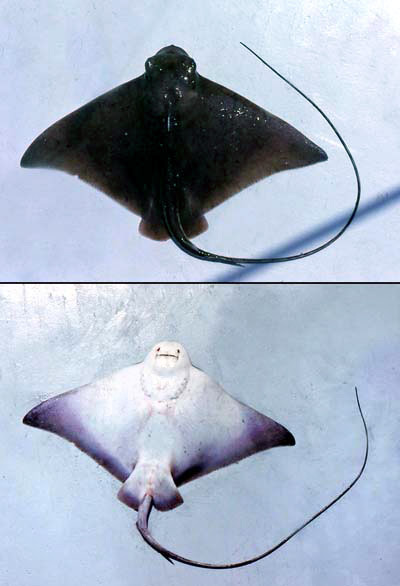 This ray has been observed occasionally leaping out of the water. In the northern portion of its range, the bullnose ray migrates northward during early summer and southward during early winter. The disc of the bullnose ray is broad with long and sharply pointed wings. The snout projects distinctly from the body, appearing similar to a duck bill. The eyes and spiracles are located on the sides of the head. There are few middorsal spines on the disc of adult bullnose rays. The corners of the pectoral fins are acute angled. The dorsal fin originates close to the level of the pelvic fin rear margins. The whip-like tail is quite long and distinctly marked off from the body. There is no caudal fin. The bullnose ray is sometimes confused with the southern eagle ray (M. goodei) however the bullnose ray can be distinguished by the origin of the dorsal fin which is close to the level of the rear margins of the pelvic fin. The dorsal fin originates well behind the level of the rear pelvic fin margins. The dorsal surface of the bullnose ray is grey, chocolate or brown while the ventral surface is pale or white. There may be diffuse whitish or yellowish small spots across the dorsal surface. The dorsal fin is occasionally pale in color and the posterior portion of the tail is dark brown or black. The teeth are green. There are seven rows of teeth in each jaw consisting of one wide row located in the middle and three rows of smaller teeth on each side. The teeth are arranged in flat hexagonal plates. There are five to six fleshy papillae on the floor of the mouth. The skin is smooth on younger individuals. Larger bullnose rays have low tubercles in a medial row on the shoulder and males may also have a single thorn above each eye. The maximum reported size of the bullnose ray is a disc width of 39.4 inches (100 cm). The adults typically reach lengths of 33.5 inches (85 cm). Males are sexually mature at 24-28 inches (60-70 cm) disc width. The bullnose ray feeds on benthic invertebrates including crustaceans and mollusks. 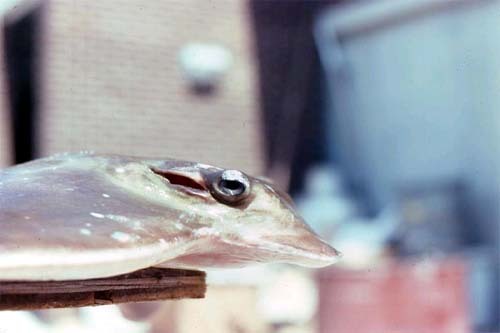 This ray locates prey items by swimming close to the bottom and undulating its “wings” (pectoral fins) and uses its subrostral lobe to expose invertebrates from the sandy sediments. The mode of reproduction of the bullnose ray is ovoviviparous. The eggs are retained in the body of the female where the embryos develop while receiving nourishment from yolk sacs. The embryos receive additional nourishment via the absorption of uterine fluid containing fat and protein. A female bullnose ray will produce four to eight embryos during a reproductive season. Each newborn has a disc width of approximately 9.8 inches (25 cm) and closely resembles the adults in morphology. Potential predators of this ray include marine mammals and large fish such as sharks. Leeches have been reported as parasites on the bullnose ray. 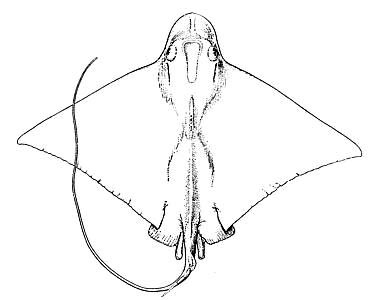 Lesueur originally described this ray in 1824 as Myliobatis freminvillii. Freminivillei appears as a misspelling of the species name in past scientific literature. The genus name, Myliobatis, is derived from the Greek, “mylo” meaning mill and “batis,-idos” meaning a ray.